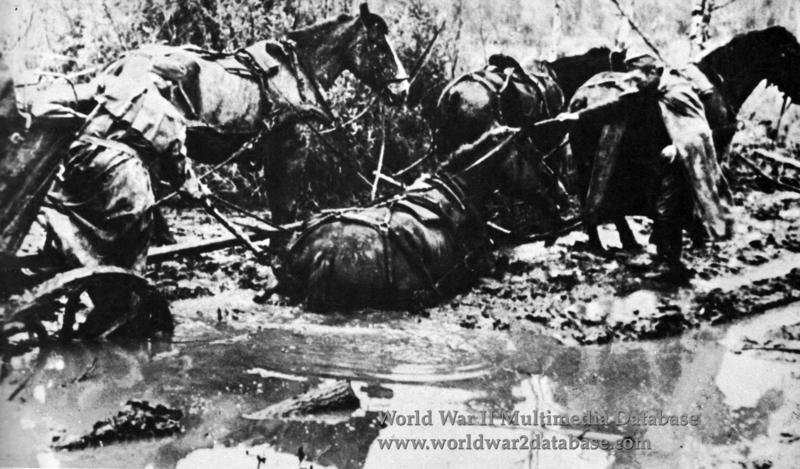 German draught horses pull a supply wagon through thick mud. Germany's armed forces relied on the horse, and 700,000 accompanied the armies in Operation Barbarossa. Frequent breaks in the advance were taken for the pack horses, not for the Landser infantry. Before the mud came after the first snow in September-October 1941, the horses were used up from the mosquitoes, choking dust and hard, deep ruts of the roads during the summer. When winter froze the ground, the cold killed the horses. German horses died at the rate of 1,000 a day during the war. The losses on the Eastern Front were made up by stripping Soviet peasants of their panje horses, which survived when the German horses did not. These small, hardy animals could make do with only a small shelter from the wind. The dead horses could hardly feed the starving German soldiers; they froze so solid, even axes could not cut up the corpses.